How ironic, the residents living in the Tegal Alur Urban Village, is having difficulty getting clean water due to the lack of clean water supply. Whereas, they have sent a request for the installation of water pumps to PT Palyja.
" Lastly, we sent a complain letter two weeks ago"
Head of Tegal Alur Anik Sulastri disclosed there are about 4 thousand households in 7 RWs need clean water supply, among others, RW 01, 02, 03, 08, 09, 11 and 12. They have complained about the condition more than 7 years. His side also has complained to PT Palyja, but it is ignored. "Lastly, we sent a complain letter two weeks ago," she stated, Thursday (12/4). Head of PT Palyja Communication Division, Mayritha Maryanie admitted PT Palyja could only serve as parts of Tegal Alur areas because of limited water resources. 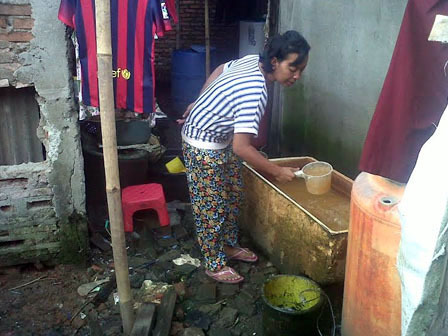 She continued, since 1998, there is no significant additional raw water in Jakarta. Meanwhile, the number of customers increased 2-fold from 200 thousand in 1998 to 404 thousand in 2013. To serve them, the company has decreased the non-revenue water (NRW) from 60 percent in 1998 to 39 percent by the end of the year 2013 ago. "Consequently, we need additional raw water supply to serve residents in Tegal Alur optimally," she admitted.